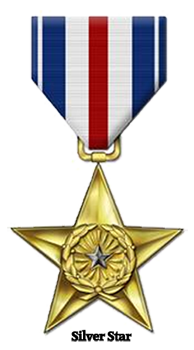 The Silver Star Medal is the third highest medal for gallantry awarded to United States soldiers. The Citation Star awarded during World War I was the predecessor to what became known as the Silver Star by Act of Congress in 1932. The gallantry displayed must have taken place while in action against an enemy of the United States, while engaged in military operations involving conflict with an opposing foreign force, or while serving with friendly foreign forces engaged in an armed conflict against an opposing armed force in which the United States is not a belligerent party and takes place over a very short time frame typically not more than a couple days, however exceptions do occur frequently. For example, it was not uncommon in World War II to award a pilot a Silver Star after becoming an Ace (5 confirmed enemy kills). Members of all branches of military service are eligible to receive the Silver Star. In North Africa, during the period of 22 January 1943 to 8 May 1943, Major Hanna displayed great courage, shrewdness of judgment, and excellent flight leadership in directing the operations of his squadron against the enemy. Major Hanna has participated in twenty-seven (27) missions over enemy territory and personally lead twenty-one (21) of these missions. Many of these missions were flown over targets which were heavily defended by flak, 47mm cannon and enemy aircraft, but with his keen knowledge and use of evasive tactics, Major Hanna brought his flights home without the loss of a single man. The services of Major Hanna reflect great credit upon himself and the military service of the United States. It is certain that such heroic deeds serve as an example of courage and heroism to all members of our armed forces. Residence at appointment: Gilroy, California. HENRY D. CHISM, JR., 1st Lieutenant, O-440345, 345th Bombardment Squadron (H), AC. For gallantry in action against the enemy. On October 3, 1942, he, while acting in his capacity as bombardier of a four engine heavy bomber (B-24D) during a difficult and hazardous mission over Navarino Bay, did drop his explosives with expert skill and precision enabling his plane to depart from the target expeditiously thereby placing it in immediate readiness for action against enemy pursuit one of which was shot down by his plane and another of which was thwarted from further attack. Residence at commission: Memphis, Tennessee.